This week’s adorable tiered wrap dress features gorgeous florals and a super cute fox print. We need your help naming it! Submit your best name idea for this dress in the comments. One lucky winner will get this dress for FREE. It comes in sizes 2, 4, and 6. *Important housekeeping notes, please read! Winner will be announced after 4:30 P.M. ET on Wednesday, 11/26/14. Please make sure you leave an active email address when you comment since that is our method of contacting the winner. If more than one person suggests the same name, we will select the first person to post. But never fear! There will be sooo many more contests and chances for winning. Please only submit once and only one name per submission. We moderate all our comments, so your submission will show up on the blog as soon as we are able to approve it. Thank you! “The Melting Pot” The fabrics on this dress are so different, but look so beautiful together! The Hansel and Gretel Dress. Absolutely. The Hills Are Alive dress! A princess and her fox. 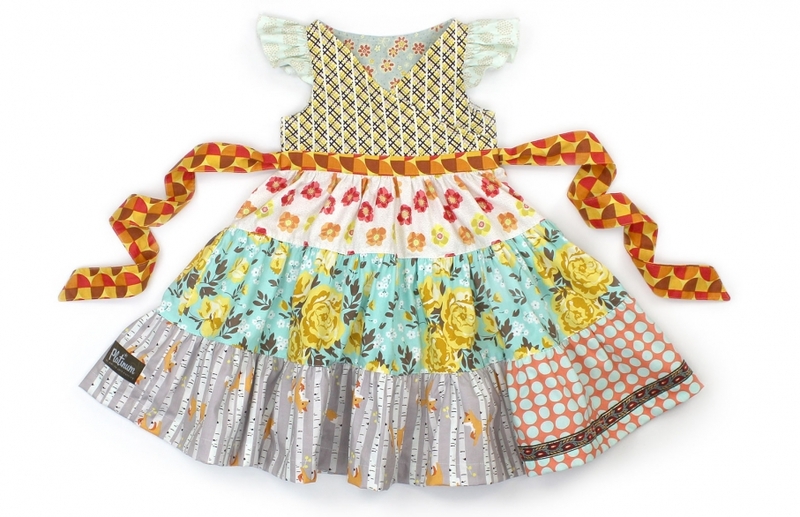 Frilly fox and posey party dress ! Aspen in the Fall, because the colors remind me of my recent trip to Aspen. gingerbread spice and everything nice! it should be called pioneer cutie! The native American Fox tribe have fox names. I’d say “leotie”…meaning: flower of the Prairie. Birch Blossom! ps I love this one! ( named after a yellow English Garden rose). The Fox has many tricks! Hansel and Gretel! Reminds me of the story for some reason. Fox on the Run —- in honor of a 70’s song by band Sweet:) Yikes I am old! Heart’s A Flutter for Fox! What Does The Fox Spy?